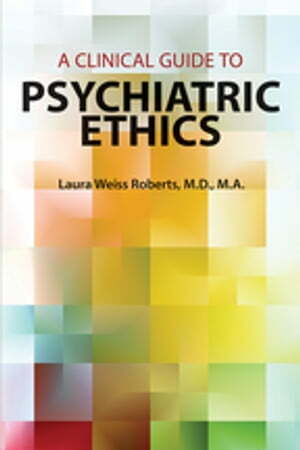 Collins Booksellers - A Clinical Guide to Psychiatric Ethics by Laura Weiss Roberts, 9781615370702. Buy this book online. In the video above, listen to the author, Dr. Roberts, discuss with Chief of Staff John M. Oldham the challenges that medical residents face in managing their own mental health and wellbeing. Professional ethics and decision making have become areas of heightened critical inquiry, as well as matters of normal but challenging psychiatric practice. Informed by the extensive clinical experience of the author and guest contributors, A Clinical Guide to Psychiatric Ethics approaches the ethical aspects of mental health care -- both subtle and dramatic -- with clarity, coherence, and optimism. This engaging text functions as both a review and a guide to issues on the horizon, as well as those encountered every day. The Guide achieves these objectives by employing several strategic features: Structured logically into three parts (Fundamentals, Caring for Special Populations, and Evolving Topics), the book takes the reader from the general to the specific and from the traditional to the emergent. Case scenarios at the end of each chapter not only focus the individual reader on the chapter's concepts and issues, but also may be used in independent study or small-group discussions. The text emphasizes real experience over remote theories, attuning readers to clinical realities with keen sensitivity. It does not offer simple answers, but provides guideposts to impart information, foster skill development, and encourage openness, collaboration, and self-reflection among both veteran clinicians and trainees. Significant focus is given to the care of individuals from distinct populations (e.g., children and veterans) and care occurring in unique contexts (e.g., small communities), underscoring the book's broad usefulness.